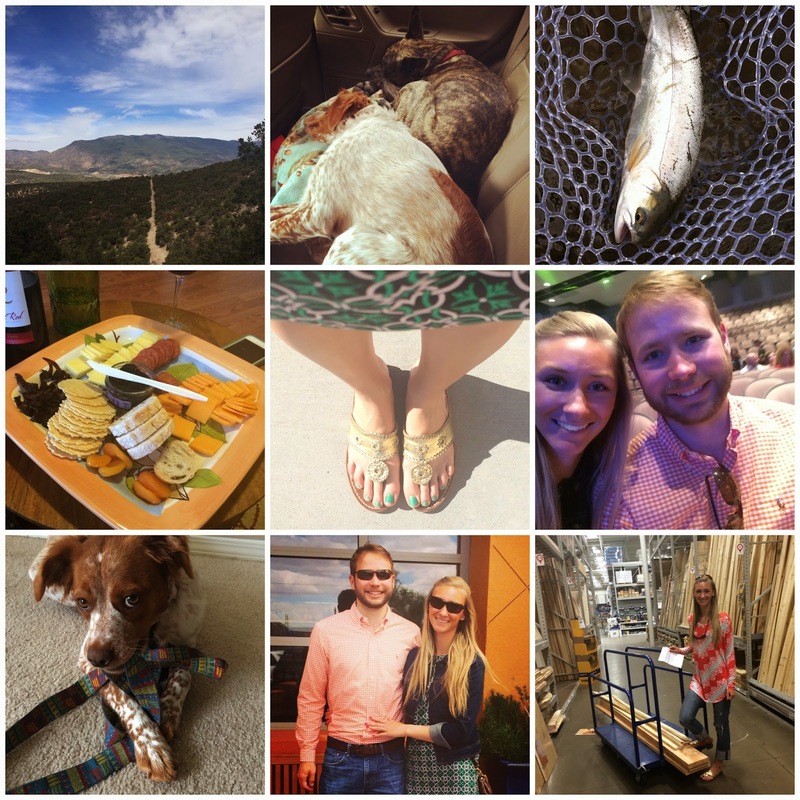 Lisa loves John: Weekend Snapshots! ONE | Saturday morning I went on a fairly difficult hike with two other girlfriends - Faerl and Marley. The hike was basically straight up to a signal tower and then back down, but the rocks were quite loose so we really had to pay attention to where we were stepping. And let me tell you, it was quite the workout! TWO | Scout and Marble (Faerl's doggie) joined us girls on the hike, and they were lovely companions. They were so tired from the hike and playing together that the slept the whole car ride home (but only after Scout ate Faerl's husband's Maui Jims... Scout clearly has expensive taste). THREE | While we were hiking, John and Faerl's husband, Jared, went fly fishing in Taos. There was a new hatch that they were pretty excited about. FOUR | John and Jared did not get home until late, so Faerl and I extended the evening post-hike with wine, yummy appetizers, face masks, manis and pedis. She also introduced me to a new show on PBS called Call the Midwives. Has anyone heard of this?!! I plan on starting the show from the beginning, but supposedly it is better than Downton Abbey (which is so my jam)! FIVE | My pedi matched my Easter Sunday dress perfectly! The weather was beautiful, and I was so excited to finally rock some sandals! SIX | John and I even got to church 20 minutes early... what?! Well, actually, we were technically 20 minutes late for the earlier service, but we decided to just wait in the car and go to the later one. SEVEN | John and I don't have any kiddos to make Easter baskets for, and this definitely works to little Scout's favor. She had a lovely little Easter and enjoyed testing out her new leash from her Easter basket. EIGHT | We were originally going to go on an Easter picnic, but decided against it (we were both pretty tired from Saturday). So instead, we went to The Grove and had some delicious food. This place is very quickly becoming my favorite restaurant. NINE | We ended Easter Sunday with a trip to Lowe's to buy some wood to make a new coffee table and TV stand. We are going to use the same basic plans as our dining room table, but obviously different dimensions. For some reason they wouldn't cut the wood for us (lameee), so we have to take it home and cut it all ourselves. We hope to finish them off tomorrow! Your girls night sounds perfect, and well deserved after that hike! Loving your pedi color, I have a similar one on now too - so pretty! Your easter dress is gorgeous! Where is it from? I love, love, love those sandals!! Hikes are the best!!! Love the meat and cheese plate!! Yes to Mani/pedi session!! Happy Monday!! Great weekend pics. Looks like it was a good one! Glad the weekend was great!! I was so pumped to rock my jacks as well (probably need a pedi though hahaha) xoxo Happy Monday! Love your Easter dress girl! Love your weekend recaps - so put together and you guys always do so much! Can't wait to see the new coffee table! Looks like you had an amazing weekend! The pic from that hike looks like it was a gorgeous day!! Happy Monday! Sounds like such a fun weekend!! sounds like a fabulous weekend! wow @ making your own furniture, awesome :) that first picture is amazing. I wish we had a grove in Huntsville, AL. Glad you and John had a lovely Easter! New follower here! Loving your blog - great style! What a perfectly fun weekend! I am so impressed that you guys are making a coffee table and TV stand. Please keep us posted on the process. Maybe I'll get a little inspiration to do it ourselves too. I've seen some families make some beautiful dining room tables too. Looks like you had a great Easter weekend! I love your toe nail polish color...can't wait to break out the sandals! What a great weekend! You seriously have the cutest outfits! I love the top/tunic you're wearing in the photo at Lowes! sounds like you had a happy easter!!! Sounds like a wonderful and very productive Easter! Love your weekend recaps! Sounds like a perfect Easter weekend. And Scout seriously has the cutest face ever!